Charles II (29 May 1630 – 6 February 1685) was king of England, Scotland, and Ireland. He was king of Scotland from 1649 until his deposition in 1651, and king of England, Scotland, and Ireland from the restoration of the monarchy in 1660 until his death. Charles II's father, Charles I, was executed at Whitehall on 30 January 1649, at the climax of the English Civil War. 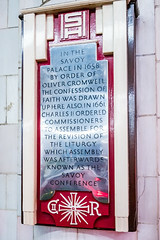 Although the Parliament of Scotland proclaimed Charles II King on 5 February 1649, England entered the period known as the English Interregnum or the English Commonwealth, and the country was a de facto republic, led by Oliver Cromwell. 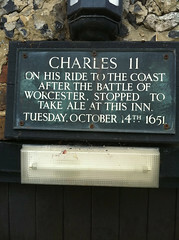 Cromwell defeated Charles II at the Battle of Worcester on 3 September 1651, and Charles fled to mainland Europe. Cromwell became virtual dictator of England, Scotland and Ireland, and Charles spent the next nine years in exile in France, the Dutch Republic, and the Spanish Netherlands. A political crisis that followed the death of Cromwell in 1658 resulted in the restoration of the monarchy, and Charles was invited to return to Britain. On 29 May 1660, his 30th birthday, he was received in London to public acclaim. After 1660, all legal documents were dated as if he had succeeded his father as king in 1649. Charles's English parliament enacted laws known as the Clarendon Code, designed to shore up the position of the re-established Church of England. Charles acquiesced to the Clarendon Code even though he favoured a policy of religious tolerance. The major foreign policy issue of his early reign was the Second Anglo-Dutch War. In 1670, he entered into the secret treaty of Dover, an alliance with his first cousin King Louis XIV of France. Louis agreed to aid him in the Third Anglo-Dutch War and pay him a pension, and Charles secretly promised to convert to Catholicism at an unspecified future date. Charles attempted to introduce religious freedom for Catholics and Protestant dissenters with his 1672 Royal Declaration of Indulgence, but the English Parliament forced him to withdraw it. In 1679, Titus Oates's revelations of a supposed "Popish Plot" sparked the Exclusion Crisis when it was revealed that Charles's brother and heir (James, Duke of York) was a Catholic. The crisis saw the birth of the pro-exclusion Whig and anti-exclusion Tory parties. 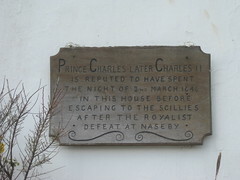 Charles sided with the Tories, and, following the discovery of the Rye House Plot to murder Charles and James in 1683, some Whig leaders were executed or forced into exile. Charles dissolved the English Parliament in 1681, and ruled alone until his death on 6 February 1685. He was received into the Roman Catholic Church on his deathbed. 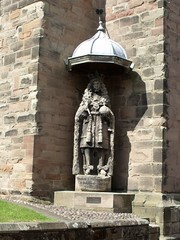 Charles was popularly known as the Merry Monarch, in reference to both the liveliness and hedonism of his court and the general relief at the return to normality after over a decade of rule by Cromwell and the Puritans. Charles's wife, Catherine of Braganza, bore no live children, but Charles acknowledged at least twelve illegitimate children by various mistresses. He was succeeded by his brother James. King Charles I of England mother? 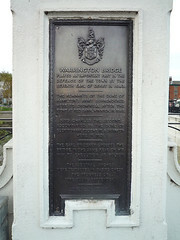 Warrington Bridge played an important part in the defence of the town by the Seventh Earl of Derby in 1643. The remnants of the Duke of Hamilton's army surrendered here to Cromwell after the fight at Red Bank, Winwick, in 1648. King Charles the Second accompanied by the Duke of Buckingham fought in a skirmish here in 1651. The Earl of Derby crossed the bridge in the same year on his way to execution at Bolton. The central arches were destroyed in 1745 to check the progress of the Young Pretender. This tablet was erected by the Warrington Society in 1927. Restoration House Built in 1587, it is said that Charles II. stayed here on the night on 28th May 1660 at his Restoration. 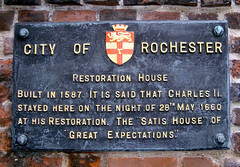 The "Satis House" of "Great Expectations". c. 1580 This building formed part of The White Hart, Petersfield's leading coaching inn until the 18th century, with stabling for over 100 horses. 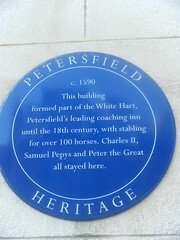 Charles II, Samuel Pepys and Peter the Great all stayed here. The Old George Inn. 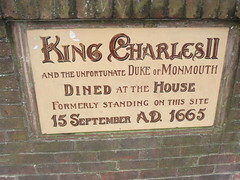 King Charles II came here September 23 1651. Barn of Upper House, Church Street, Madeley. 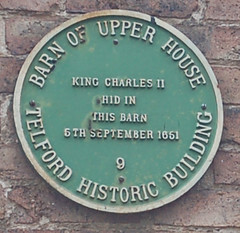 King Charles II hid in this barn, 5 September 1651. 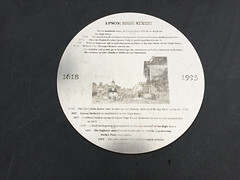 Epsom High Street Three hundred years of history have left their mark on the high-street. 1618 The mineral well on Epsom Common is discovered to have medicinal qualities. 1672 Thomas Shadwell's play Epsom Wells is performed for Charles II. 1707 John Livingstone opens entertainment facilities at the New Wells off the High Street. 1724 Defoe’s Tour Through Britain comments:- ‘…the nobility and gentry go to Tunbridge, the merchants and rich citizens go to Epsom… the common people chiefly to Dulwich and Streatham’. 1779 The first Oaks horse race is run on the Downs, followed by the first Derby in 1780. 1833 Epsom market is established in the Highs Street. 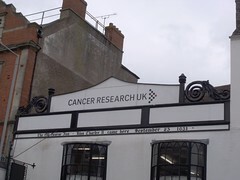 1847 railway station opens in Upper High Street, followed by one on the presence of in 1859. 1937 A dual carriageway is completed in the eastern half of the High Street. 1990 The highway moved to the north side try provide a pedestrian Market Place once again. 1993 The new Market Place improvement scheme is completed. St Martin's Gate St Martin's Gate was probably the largest of Worcester's medieval gates, and was also known as the East Gate. First recorded in the reign of Henry II (1154-1189), it was the last of the gatehouses to be demolished, in 1787. It led to the industrial suburb of Silver Street and Lowesmoor and the low-lying marshy land of the Frog Brook valley, and then on to Droitwich. 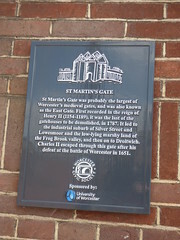 Charles II escaped through this gate aftr his defeat at the battle of Worcester in 1651.